The Sony Alpha A380 is Sony's answer to the Canon 500D and the Nikon D5000 - but does it measure up? Sony is a relative newcomer to the DSLR market, having taken control of Konica Minolta's photographic division after it pulled out of the photographic business in 2005. 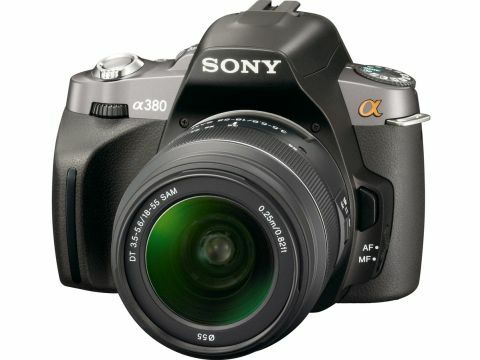 The Sony Alpha 380 is the most highly specified of three simultaneous new releases from Sony, alongside the A280, A330 and A300, and is designed to appeal to both first-time DSLR buyers and enthusiasts. It directly replaces the Sony Alpha 350, which was released last June and shares many of the same major features as its predecessor. These features include a 14 million-pixel CMOS sensor and a unique 'Quick AF Live View' mode, but all in a newly designed, lighter body. On paper, it's Sony's best entry-level DSLR so far, but does the A380 have what it takes to compete with new HD video-equipped competition from Canon, Nikon and Pentax? The Alpha 350 was notable at its release for its unique 'Quick AF Live View' system, and the A380 incorporates the same technology. Rather than using the main imaging sensor to generate the live view image, which entails slow contrast-detection autofocus, the A380 features a secondary CCD sensor above the viewfinder, specifically for live View. When the system is activated, one of the mirrors inside the viewfinder assembly changes position, and redirects the image coming through the lens onto this secondary sensor. The resulting picture is displayed on the camera's screen. The benefit of this system is that the A380's 'normal' AF mode, which is centred around a specially designed sensor beneath the main mirror, is still operational, so the Alpha 380 can offer full-speed, uninterrupted phase-detection autofocus in live view – something that no other camera on the market can match. The only potential downside to the system for some photographers is that due to the low resolution of the live view sensor, it is not possible to magnify the live view image for accurate manual focussing.